You are at a new amusement park and decide to try out the funhouse. So you get into one of the cars and away you go. It’s a good one, maybe one of the best you’ve ever entered, nicely balanced between special effects and real actors who are so convincing that you forget they’re acting. At the end, you discover it really isn’t the end at all; the exit is 500 feet over the park, and what you have just experienced is merely a prelude to a rollercoaster ride that is going to make your stomach flip upside down two or three times before it's through. "Don’t let your heart rate relax...because Hurwitz continues to pour on surprises, big and small and in between, practically until the end." 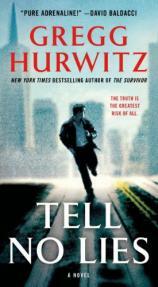 That, my friends, is what you are in for with TELL NO LIES, a new stand-alone thriller from Gregg Hurwitz. Defying conventional wisdom --- which, more often than not, is neither --- Hurwitz begins the story rather sedately though not slowly, quietly ratcheting the suspense quotient up from the first page. We are introduced to Daniel Brasher and his wife, Cristina, a community organizer who, on a daily basis, jousts with windmills that often strike back. Brasher comes from the oldest of the San Francisco old school fortunes, and has demonstrated that he knows how to handle it, having accumulated quite a pile as a money manager to the rich and anonymous of the city while turning his back on the family wealth. However, he has other plans with his life and is working at a job that he finds more fulfilling: meeting three nights a week with recently paroled ex-convicts in his role as a group counselor. As the book opens, Brasher is getting ready to transition from low-key public work in a barely standing government office to a private counseling practice within spitting distance of his former financial planning office. Just weeks before he is scheduled to change positions, however, Brasher finds an envelope addressed to someone else in his work mailbox. It contains an unsigned warning on a single sheet of paper, giving the addressee a deadly warning to make an admission of guilt. By the time Brasher finds and opens the envelope, the deadline has passed and the addressee is the victim of a vicious murder. Brasher discovers that there are other misdirected envelopes in his mailbox with similar warnings. While working with the police, Brasher makes an effort to save each potential victim, a mission that puts him on a collision course with a mysterious masked murderer whose motives in selecting his victims is unknown. Just when the thread that connects the victims begins to reveal itself, Brasher himself receives a warning and a deadline, as he realizes that the killer is much closer to him than he ever thought possible. TELL NO LIES seems to wrap up 60 or so pages too early. Don’t let your heart rate relax (remember my example about the funhouse and the rollercoaster?) because Hurwitz continues to pour on surprises, big and small and in between, practically until the end. Hurwitz’s extensive experience with writing screenplays and graphic novels is on display here as well; one can see the narrative unfurling across the page as if it were a large screen, with San Francisco, beauty and warts side by side, serving as a beautiful and dangerous backdrop to the story. Equal parts thriller and mystery, TELL NO LIES is built upon the finest elements of both genres.